Your garden containers are more than a pot to hold soil and plants. They are the plants' living quarters, and they decorate your home and landscape as well. That is why you need to make sure your containers are in good shape. Dirty planters can affect plant health, and faded or drab looking pots distract from the appearance of your arrangement. Read below for advice on how to keep your garden containers in great shape! 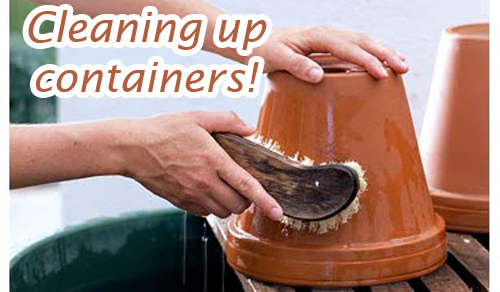 They are outside, they get wet, they hold dirt - so why should you bother to clean containers? The answer is easy. Plants grow better in a clean and sterile environment, and you lower the chances of having pests and diseases hanging around to harm your plants. 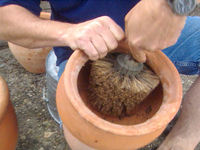 Start by getting rid of potting soil and debris by brushing the inside and outside of the container thoroughly. Use a stiff wire brush for the job and get better results. 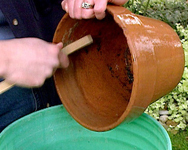 Wash small pots in a basin or bucket filled with hot, soapy water. You can also add a few drops of liquid household bleach to the water. Be sure to scrub inside and outside. Rinse the planters well and allow to air dry overnight before replanting. Remember to use fresh soil mix, to minimize insect and disease problems. Awesome flowers in shabby containers or pretty pots on chipped and peeling plant stands don't provide the good looks that we bet you're going for. Naturally, containers exposed to the elements invariably fall into disrepair. Here are a few tips to help keep them looking great! Inspect all planters at the start of the season for any signs of chipped or cracked paint. Wash off any dirt and let them dry overnight. If you need to repaint the pot by sanding the surface first and then spraying the paint and letting it dry. Finish with a coat of clear protectant designed for outdoor use. If there is a crack then patch it before use. This will keep the water from penetrating into the crack and causing the pot to break down over time. You can save work in the long run if you make sure that your containers are ready to withstand the elements before you begin planting. Read more.....Simple Container Gardening Tips! Read more.....Choose pots for their Appeal!